Just when I am shutting off all cheap editions3, I am sorry to have Mr. Cape4 steal a march5 on me. If I could see any possible way to stop it, I would. But I could hardly expect that your arrangement with Murray6 was of a nature that would prevent them from disposing of the book7 in whatever way they wished. I have been travelling, and Cape's letter, with yours, reached me only a few days ago. I am sending him the preface he asks for, simply because I do not want this book to come out in England8 as a new book. When you asked me9 to write a preface for your new edition I had a hundred things on hand and was packing to go West. I simply couldn't sit down and write a preface. But idf you wish to use this one10 in later printings, I have no objection. I shall be here2 until September, at any rate. Faithfully yours Willa Cather Postscript: Dear F.G.
After I had sealinged my letter, it occurred to me that it may be too late to include a Preface in future printings because of change in pageing etc. 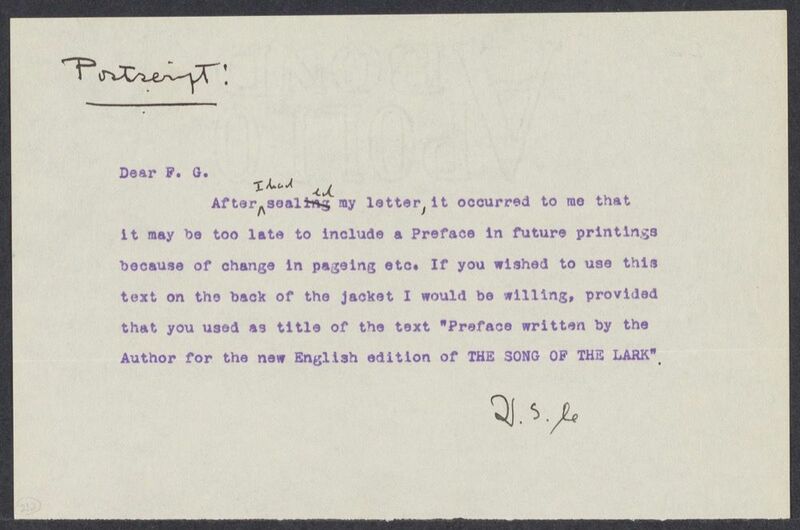 If you wished to use this text on the back of the jacket I would be willing, provided that you used as title of the text "Preface written by the Author for the new English edition of THE SONG OF THE LARK". On 21 June 1932, Greenslet forwarded a letter from Jonathan Cape, approving Cape's proposal to put The Song of the Lark into Cape's Traveller's Library. On 28 July 1932, Greenslet wrote that Cape could "not have been stopped" from issuing The Song of the Lark in the Traveller's Library. 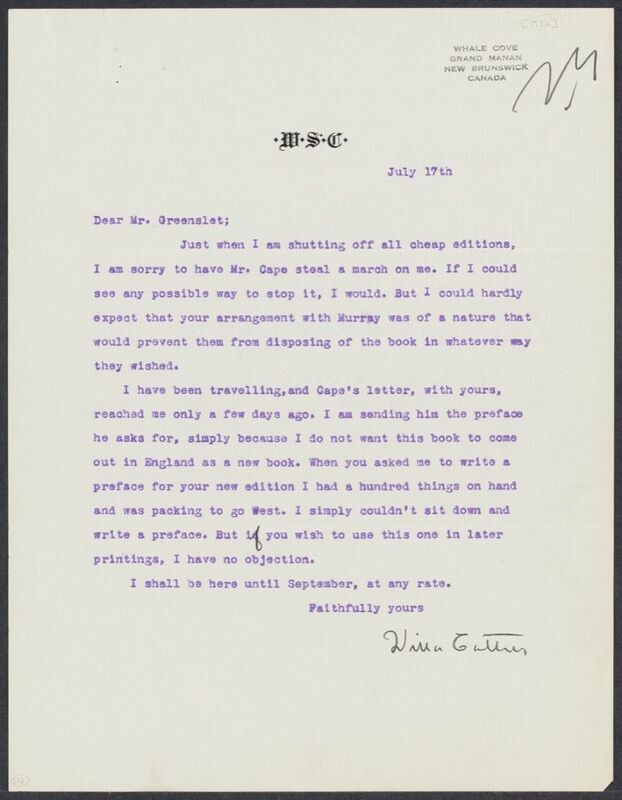 He also suggested that Houghton Mifflin would use Cather's preface in later printings and rejected her suggestion in the postscript that it might appear on the back jacket. Cape, Herbert Jonathan (1879-1960) (“Jonathan”). British publisher. Born in London, England, Cape began his career in his early teens as errand boy at Hatchard’s bookstore. 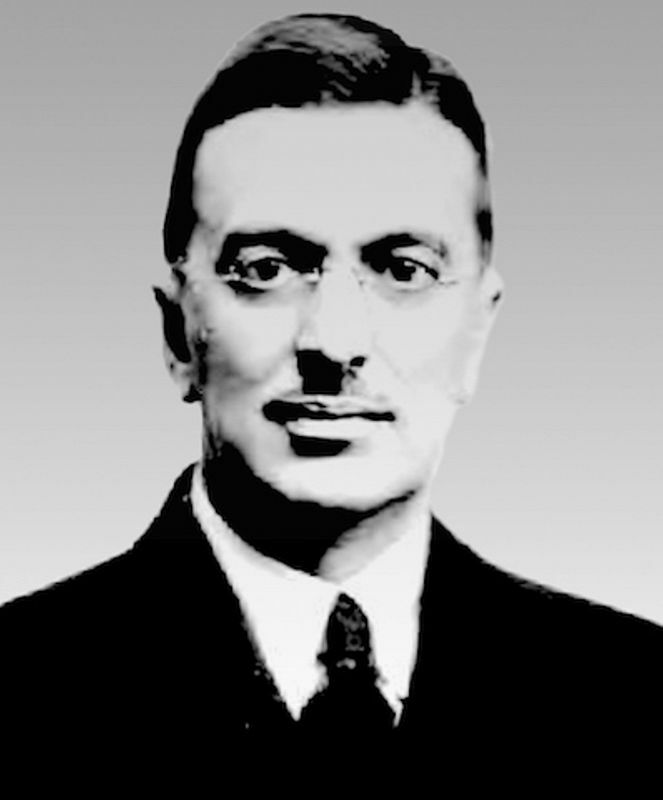 He worked for the London branch of Harper’s as clerk and salesman, and then at publisher Gerald Duckworth’s company, rising to manager by 1911. In 1920, he and George Wren Howard founded the publishing company Jonathan Cape, which was known for the high quality of their design and fine list of authors, including some Americans. Cape bought the rights to Cather’s The Song of the Lark (1915) from the first British publisher John Murray and brought out a pocket edition in 1932. Cather was unhappy at the reduced royalties and transferred the rights to Cassell, which had become her British publisher.